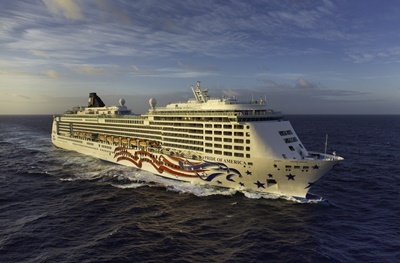 Experience the beauty and Aloha spirit of the exotic Hawai’ian Islands year-round aboard Norwegian Cruise Line’s Pride of America – a favourite with families, multi-generational groups, couples and honeymooners. Travellers can take advantage of Norwegian Cruise Line’s ‘Free at Sea’ offer – allowing guests the choice of up to five free offers including a one-night pre-cruise hotel stay or a free Specialty Dining Package. Norwegian Cruise Line has been sailing out of Honolulu for 15 years and is the only cruise line to sail Hawai’i every week, year-round. Pride of America visits the four islands of O’ahu, Maui, The Big Island of Hawai’i, and Kaua’i in seven days with no sea days, offering guests more onshore time. This itinerary has been awarded ‘Best Hawai’i Itinerary’ by readers of Porthole Cruise Magazine for 13 years in a row. “Travellers visiting Hawai’i always want to get the most out of this magical destination, which is why Norwegian Cruise Line has created this four-island itinerary with overnight stays in Maui and Kaua’i, to best maximise our guests’ time so they can experience the real culture and beauty of this spectacular island state,” said Nicole Costantin, Vice President Sales Australia and New Zealand at Norwegian Cruise Line. 4 islands and 5 ports in 7 days: Guests can enjoy extensive port time to explore onshore destinations, in addition to overnight stays on the majestic Maui and Kaua’i islands. Onboard experiences: Cruising from port–to-port and along the Nā Pali Coast, guests can enjoy the stunning views and scenery from an array of outdoor spaces. Plus, guests can experience superb cuisine, stellar entertainment and immerse themselves in Hawai’ian experiences on board Pride of America. Learn from the locals: Norwegian Cruise Line is proud to employ local Hawai’ians on board Pride of America. Guests can learn about the Hawai’ian way of life from Norwegian’s friendly staff while enjoying a shore excursion, land tour or cruising. Onshore experiences: Experience legendary Hawai’ian hospitality, snorkel with turtles off the beautiful beaches of Maui, stroll the white sand of Honolulu’s Diamond Head Beach, marvel at the dramatic cliffs of the Nā Pali Coast, explore the ancient sites of the city of Kona, discover cascading waterfalls and even learn to hula dance! There’s plenty of shore excursions to choose from or see it your own way – it’s up to you. Extend your trip: All Pride of America guests have an opportunity to enjoy a pre-cruise O’ahu Explorer Cruisetour which runs over four days prior to each sailing. The tour invites guests to explore O’ahu like a local, with highlights including wandering the surf towns of Haleiwa, exploring historic World War II sites such as Pearl Harbor and traversing the majestic peaks of Kualoa Ranch. Receive a free offer: All sailings enjoy Norwegian’s Free at Sea package, which invites guests to enjoy up to five free offers such as a one-night hotel stay, pre-paid service charges, a specialty dining package, a USD$50 shore excursion credit per port and, on selected departures, the option for friends and family to sail at a reduced rate. Pride of America’s extensive mix of entertainment, dining and relaxation options will offer everyone, from toddlers and teens to couples and retirees, a plethora of places to eat, drink and unwind after a day’s sightseeing. The selection of 16 restaurants on board includes two main dining rooms and specialty favourites Cagney’s Steakhouse, La Cucina and Jefferson’s (French) Bistro. The options continue after dark, when the action moves to 12 bars and lounges, including Pink’s Champagne Bar, Waikiki Bar, the New Orleans inspired Mardi Gras Cabaret Lounge & Nightclub, comedy and magic shows at the Hollywood Theater or all-night dancing during the White Hot Party. For a change of pace, take a refreshing dip in the Oasis Pool or Miami-inspired South Beach Pool, pamper yourself with a choice of over 50 treatments at Mandara Spa, play board games in the Shuffles Card Room, or hit one of the onboard boutiques for a spot of retail therapy. For further information on Norwegian Cruise Line visit ncl.com; contact us in Australia on 1300 255 200 or in New Zealand on 0800 969 283.